Penumbral eclipses of the Moon are rarely of much interest. However, the first eclipse of 1999 is an exception since it falls into the unusual category of the total penumbral eclipse. In order for a penumbral eclipse to be total, the Moon must pass centrally through the penumbral annulus and its apparent diameter must not exceed the width of the penumbral ring. According to eclipse experts Jean Meeus and Hermann Mucke , during the 45+ century period 2001 BC to 2526 AD there are 10936 lunar eclipses, 132 of which are total penumbral eclipses. This corresponds to a mere 1.2% of all eclipses. The first eclipse of 1999 occurs several weeks after Earth reaches perihelion, a time when the umbral and penumbral shadows are at their minimum and maximum diameters, respectively. This allows the Moon to marginally squeeze completely within the penumbra without the Moon's limb entering any portion of the umbra. Nevertheless, the Moon's norhed in cant 0.7 arc-minutes of the umbra making this event quite obvious, even to the naked eye. Greatest eclipse occurs at 16:17 UT and will be visible from western Canada and the U.S. as well as the Pacific, Asia, Australia and eastern Europe and Africa. The Moon's path through Earth's shadow(s) as well as a map showing worldwide visibility of the event are shown in Figure 1. The first solar eclipse of 1999 is annular and is confined to the southern hemisphere Figure 2. Eclipses in this Saros series changed from total to annular during the early 20th century. As a consequence, the path of the antumbra is quite narrow and the duration is short. The central path begins about 1000 kilometres south of South Africa at 04:57 UT. An hour and a half later, the instant of greatest eclipse occurs in the middle of the Indian Ocean (06:34 UT). The path is only 29 kilometres wide and the duration of annularity is a brief 40 seconds. Nearly another hour passes before the antumbra finally reaches land. The path of annularity crosses into southwestern Australia about 300 kilometres north of Perth at 07:28 UT (Figure 3). The Sun's altitude is then 45°, the path width is 42 kilometres and the duration of annularity is 48 seconds. At mid-eclipse, the annular ring of the Sun will have a mean thickness of only 9 arc-seconds! Since the Moon's limb exhibits orthographic features on the order of 3 to 5 arc-seconds, this event should offer a spectacular display of Baily's Beads. Continuing on its northeastern course, the path crosses arid parts of Western Australia through relatively remote and unpopulated areas. Entering the Northern Territory, the antumbra passes 400 kilometres north of Alice Springs at 08:00 UT. The Sun's altitude will then be 39° as the path width (48 kilometres) and central duration (51 seconds) gradually increase. This occurs because the curvature of Earth brings these regions further from the Moon and deeper into the antumbral shadow. The path stretches through northern Queensland passing 100 kilometers north of Cairns where a partial eclipse of magnitude 0.97 will be seen with the Sun 10° above the horizon at 08:07 UT. The path ends three minutes later in the Coral Sea. The length of the entire path of annularity is approximately 13,700 kilometres which encompasses about 0.20% of Earth's total surface area. Path coordinates and centre line circumstances are presented in Table 1. Local circumstances for cities throughout the path are given in Table 2. All times are given in Universal Time. The Sun's altitude and azimuth, the eclipse magnitude and obscuration are all given at the instant of maximum eclipse. The appearance of the eclipse at maximum phase for a number of locations is depicted in What Will The Eclipse Look Like? Although this eclipse is nearly total, observers are cautioned that solar filters are still required even during the exquisitely narrow annular phase. Direct naked eye viewing could lead to eye damage or even blindness. At several recent annular eclipses, observers have demonstrated that it is possible to photograph prominences and the innermost corona. These features are visible along the Moon's dark limb opposite the brilliant crescent immediately before and after the annular phase. Great care should be taken to block or occult the bright solar crescent. Refractors of good quality are favored here since any internal reflections will lower the contrast or even obscure the prominences or corona. Since the Moon obscures over 98% of the Sun, this eclipse is especially favored for making such observations during annularity. The second and final lunar eclipse of the year occurs in Capricornus (Figure 4). The event is a moderate partial eclipse with the Moon's southern limb dipping 12 arc-minutes into Earth's umbral shadow. Although first penumbral contact occurs at 08:56 UT, most observers will have difficulty detecting the eclipse before 09:45 UT or so. The partial eclipse commences with first umbral contact at 10:21 UT. The partial phases last nearly two and a half hours before ending with last umbral contact at 12:45 UT. Although it can not actually be observed, the eclipse technically ends when the Moon leaves the penumbral shadow at 14:11 UT. At the instant of greatest eclipse (11:34 UT), the Moon will stand at the zenith for observers in the South Pacific. At this time, the umbral magnitude peaks at 0.4015 as the centre of the Moon passes 3 arc-minutes north of the umbra. Various phases of this event will be visible to most observers in the Western Hemisphere just before moon set.. However, the partial phases will only be visible west of the Great Lakes in North America. The Moon's path through Earth's shadow(s) as well as a map showing worldwide visibility of the event is shown in Figure 4. Excitement has been building for several years in anticipation of the last total solar eclipse of both the 20th century and of the Second Millennium. The trajectory of the Moon's shadow carries it across central Europe, Turkey, the Middle East, Pakistan and India (Figure 5). The path of totality begins in the North Atlantic about 300 kilometres south of Nova Scotia where the Moon's umbral shadow first touches down on Earth at 09:31 UT. Along the sunrise terminator, the maximum duration is a mere 47 seconds from the centre of the 49 kilometre wide path. Sweeping across the North Atlantic, the umbra reaches first landfall at the Isles of Scilly off the southwestern coast of England at 10:10 UT. At this locale, the mid-morning Sun stands 45° above the eastern horizon. One minute later, the umbra arrives along the shores of the Cornwall Peninsula. In the following four minutes, the shadow skirts the southern coast giving eager observers a brief taste of totality. Plymouth, the largest English city in the path, is north of centre line and witnesses a total phase lasting 1 minute 39 seconds. London misses the total phase but experiences partiality with a maximum magnitude of 0.968. By 10:16 UT, the umbra leaves England as it quickly traverses the English Channel. The Channel Islands of Guernsey and Jersey lie just south of the path and witness a partial eclipse of magnitude >0.995. To the north, Alderney is deep in the path and enjoys over one and a half minutes of totality. Not since 1961 has the Moon cast its dark shadow upon central Europe (Figure 6). The southern edge of the umbra first reaches the Normandy coast just as the northern edge leaves England (10:16 UT). But another four minutes elapse before the centre line makes landfall in northern France. As the shadow sweeps through the French countryside, its southern edge passes 30 kilometres north of Paris. The City of Lights will bear witness to a partial event of magnitude 0.992 at 10:23 UT. Continuing on its eastward track, the path's northern limit crosses into southern Belgium, Luxembourg and Germany. Meanwhile, the centre line cuts through Champagne where the citizens of Metz witness a total eclipse lasting 2 minutes 13 seconds (10:29 UT). Four minutes later, the entire umbra crosses into southern Germany and the picturesque Rhine Valley. Stuttgart lies near path centre for 2 minutes 17 seconds of totality. At 10:35 UT, the Sun's altitude stands at 55° from the centre of the 109 kilometre wide path. Although MŸnchen (Munich) lies 20 kilometres south of the centre line, the city's two million citizens will still witness more than two minutes of totality, provided the winds of good fortune bring clear skies on eclipse day. At 10:41 UT, the umbra leaves Germany and crosses into Austria where it encounters the Eastern Alps. 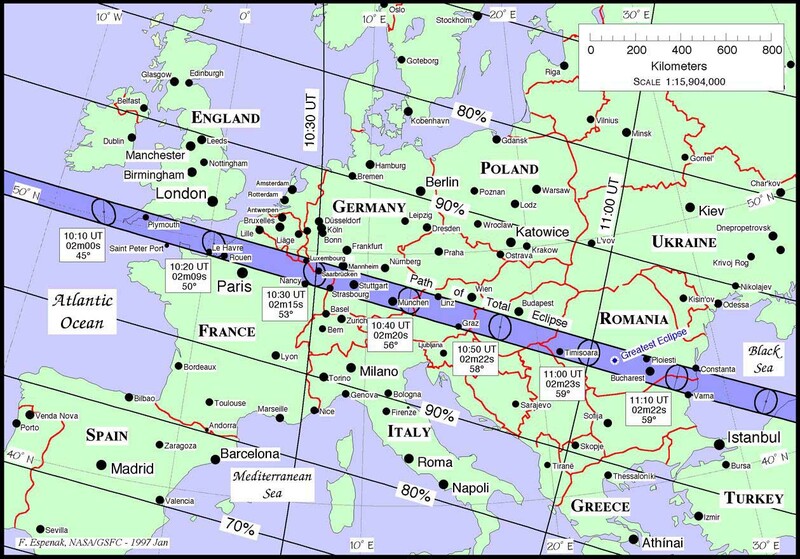 Wien (Vienna) is almost 40 kilometres north of the path and experiences a 0.990 magnitude partial eclipse. The southern edge of the path grazes northeastern Slovenia as the shadow enters Hungary at 10:47 UT. Lake Balaton lies wholly within the path where the central duration lasts 2 minutes 22 seconds (10:50 UT). Like Wein, Budapest is also located about 40 kilometres north of the path where a 0.991 magnitude partial eclipse will occur. As the shadow leaves Hungary, the southern third briefly sweeps through northern Yugoslavia before continuing on into Romania. The instant of greatest eclipse 1 occurs at 11:03:04 UT when the axis of the Moon's shadow passes closest to the centre of Earth (gamma2 =0.506). At that moment, the shadow's epicentre is located among the rolling hills of south-central Romania very near Rîmnicu-Vîlcea. The length of totality reaches its maximum duration of 2 minutes 23 seconds, the Sun's altitude is 59°, and the path width is 112 kilometres. Four minutes later (11:07 UT), Romania's capital city Bucuresti (Bucharest) is engulfed by the shadow. Since Bucharest lies on the centre line near the instant of greatest eclipse, it enjoys a duration nearly as long at 2 minutes 22 seconds. Traveling east-southeast, the path encompasses the Romania-Bulgaria border before leaving land and heading out across the Black Sea. The next landfall occurs along the Black Sea coast of northern Turkey at 11:21 UT. Ankara lies 150 kilometres south of the path and witnesses a 0.969 magnitude partial eclipse. The track diagonally bisects Turkey as it moves inland while the centre line duration begins a gradual but steady decrease. At 11:29 UT, Turhal falls deep within the shadow for 2 minutes 15 seconds. The umbra reaches Turkey's southeastern border at 11:45 UT and briefly enters northwestern Syria as it crosses into Iraq. The centre line duration is now 2 minutes 5 seconds with the Sun's altitude at 50°. Baghdad lies 220 kilometres south of the path and experiences a 0.940 magnitude partial eclipse. Arriving at Iran's western boundary at 11:52 UT, the shadow spends the next half hour crossing sparsely populated mountain ranges and deserts. Tehran lies north of the path where its eight million inhabitants witness a 0.943 magnitude partial eclipse. At 12:22 UT, the shadow enters Pakistan and skirts the shores of the Arabian Sea. Karachi is near the centre line and experiences 1 minute 13 seconds of total eclipse with the Sun 22° above the western horizon. The umbra arrives in India, the last nation in its path, at 12:28 UT. As the shadow sweeps across the sub-continent, its velocity rapidly increases while the centre line duration drops below one minute and the Sun's altitude decreases to 7°. The eleven million inhabitants of Calcutta will witness a 0.879 magnitude partial eclipse with the Sun a scant 2° above the western horizon. Leaving India just north of Vishakhapatnam at 12:36 UT, the shadow sweeps into the Bay of Bengal where it departs Earth and races back into space (12:36 UT), not to return until the next millennium. The length of the entire path of totality is approximately 13,700 kilometres which encompasses about 0.21% of Earth's total surface area. Path coordinates and centre line circumstances are presented in Table 3. Local circumstances for cities throughout the path are given in Table 4. All times are given in Universal Time. The Sun's altitude and azimuth, the eclipse magnitude and obscuration are all given at the instant of maximum eclipse. The appearance of the eclipse at maximum phase for a number of locations is depicted in What Will The Eclipse Look Like? A full report Eclipses During 2000 will be published next year in the Observer's Handbook 2000. The site features predictions and maps for all solar and lunar eclipses well into the 21st century. Special emphasis is placed on eclipses occurring during the next two years with detailed path maps, tables, graphs and meteorological data. Additional catalogs list every solar and lunar eclipse over a 5000 year period. Other information includes tips on eclipse observing, eclipse photography and eye safety. Observer's reports and photographs from past eclipses are also available.